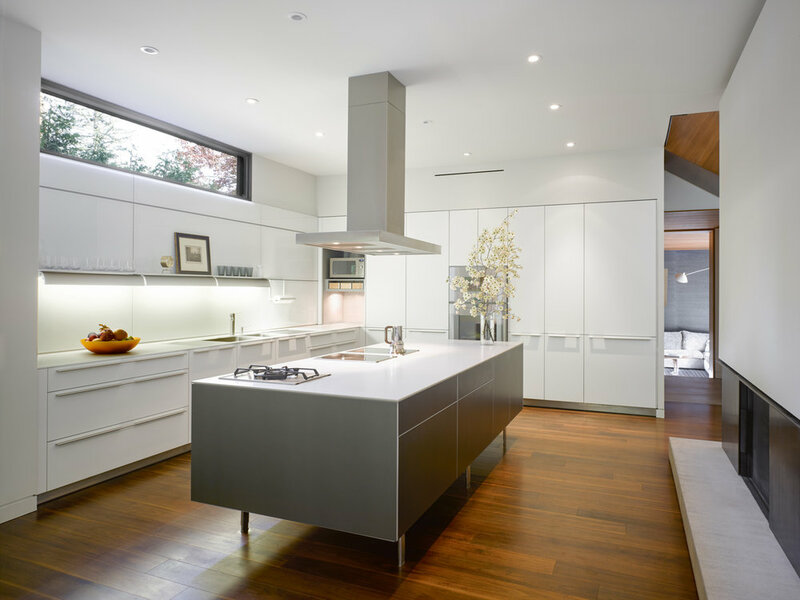 "Built for a family of five, this house in Toronto’s Hoggs Hollow neighbourhood occupies a deep lot on a reverse ravine, with a heavily forested slope rising steeply behind. superkül’s renovation and addition respects the legacy of the existing bungalow’s Mid-Century Modern heritage while establishing a deeper connection to site. Consequently, the existing motif of courtyards and enclosures has been amplified to focus attention and activity to particular zones of the house, and the smooth integration of interior and exterior spaces has been achieved. Landscape gestures break up the expanse of the lot to create layers of experience and intermediary zones of progression. Planted with shallow grasses, a Corten-enclosed forecourt softens and mediates the approach to the front door. To the right, a sheltered carport retained from the original house projects beyond the street-facing elevation, beckoning entry under the canopy of the elegantly flat-roofed enclosure. The ground-floor expansion respects the home’s previous footprint, with the bulk of the additional square footage manifesting in the partial second-floor addition, which is set back from the projecting carport in deference to the clean, spare lines of the existing structure. Material harmony is established on the exterior; the original white brick cladding was retained, complemented by concrete block, cement board, and marine-grade plywood stained a deep mahogany. On the interior, the spaces are open, fluid and well-lit in keeping with Modernist principles. 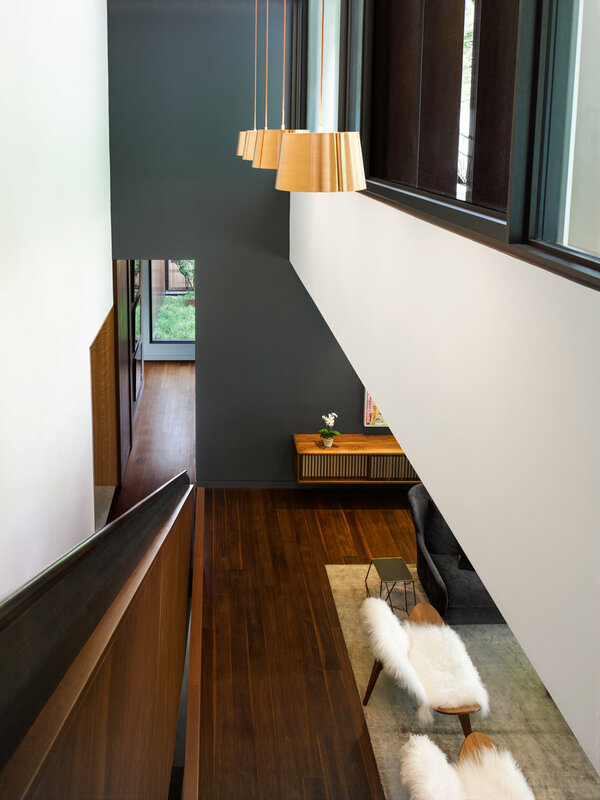 The organizing device of the stair articulates the east-west spine of the house; the primary living areas are located at the rear to capitalize on views of the majestic trees and lushness of the rising ravine wall. Here, a sizeable deck constructed from hard-wearing ipe wood extends to envelop the garden landscape; it becomes an outdoor room unto itself, a three-sided open-air courtyard. A varied and textured material palette addresses the clients’ predilection for colour and contrast. As such, numerous compatible wood finishes were specified: walnut floors and teak and cherry mill-work predominate, accented by dark steel plate in the fireplace surround and the stair-railing assembly. The study in material and tonal contrasts is most apparent in the den, which is impactful in its intimate and subdued ambiance. 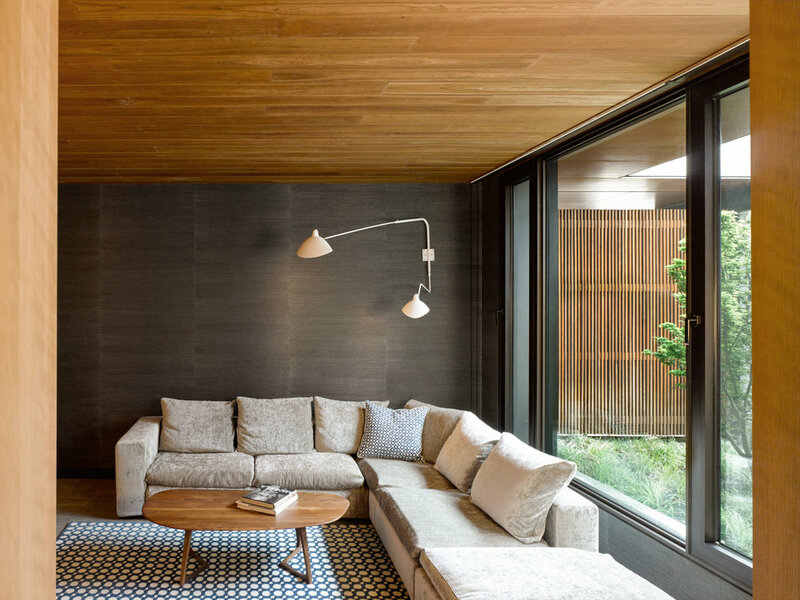 Light from the west-facing window wall makes the subtleties of the room perceptible, highlighting the delicate textures and striations of the dark grey wallpaper and the pleasing grain of the cherry-wood ceiling." 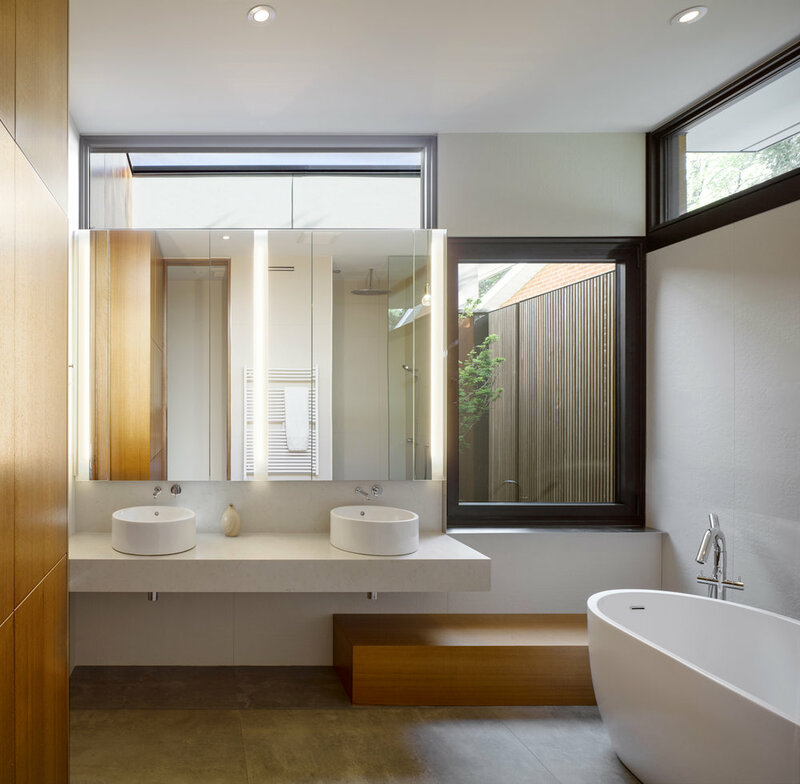 Landscape Architect: Fox Whyte Landscape Architecture & Design Inc.